According to a US survey, 49% of millenials view socialism favourably. This empty aspiration appeals to a user pays youth generation who have no idealogical [sic] compass, and is best expressed through the naked narcism [sic] of Key’s son. [Key appeals] to our anti-intellectualism… He’s so laid back he burns books on his BBQ. This empty aspiration appeals to a user pays youth generation who have no idealogical [sic] compass, and is best expressed through the naked narcism [sic] of Key’s son. Bradbury is right to suggest that Key’s PR-guided personality appeals to a certain Kiwi anti-intellectualism, a blokey ‘she’ll be right’ attitude in the context of the global financial crisis. National is supported by the rich, and by insecure middle-class folks relying on the property boom – which raises the question, how many people in their 20s own houses? Although Bradbury may have a point about Key’s media-savvy philistinism, he’s wrong to imply that Key’s base is primarily young. While Young Nats offer a horrifying spectacle of privileged self-indulgence, this does not represent most ‘millenials.’ According to early voting statistics from 2014, students voted for a change of government, with Labour-Green-Internet Mana at a combined total of around 50%, and National votes at 37% (around 10% lower than the national average). This doesn’t say anything special about Kiwi millenials: youth generally tend to be progressive. 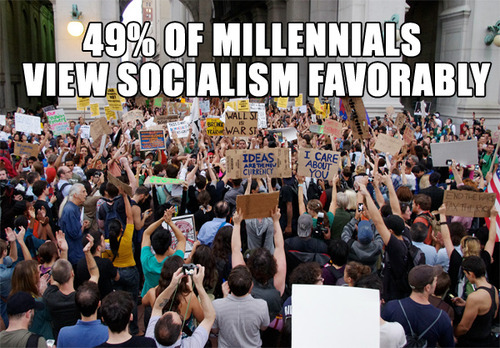 According to a US survey, 49% of millenials view socialism favourably. National’s electoral strength can be explained not only by who votes for them, but who doesn’t vote at all. 2011 saw the lowest turnout since the 19th century, and 2014 wasn’t a significant improvement. The ‘missing million’ of non-voters is comprised largely of youth, migrants, tangata whenua, poor and working-class citizens – the demographics most likely to vote left. Surveys of non-voters reveal that they are more likely to cite disengagement (eg “my vote wouldn’t have made a difference”) than a perceived practical barrier (eg “I couldn’t get to a polling booth”). After 30 years of neoliberal assault and entrenchment by successive Labour and National governments, it’s unsurprising that so many are disenfranchised. Generational narratives about ‘millenials’ and ‘Baby Boomers’ do in some ways resonate with lived experience. For example, I was born in 1988, during the reign of the Fourth Labour Government. Although Pākehā and relatively well-off, I was born into a world of privatisation, declining real wages, and ballooning private debt. Since leaving home I’ve only worked short-term casualised jobs, and lived in poorly maintained flats. If I’m part of a ‘user pays’ generation, I owe this in large part to Baby Boomers like Phil Goff, who introduced student loans (after getting through university with a universal student allowance). With a $40,000 student loan, I’m not inspired to vote for a party that recently promoted Goff as a potential Prime Minister. However, generational narratives can also also conceal reality. Baby Boomers, in general, did not implement neoliberalism: a global minority carried out this assault. Many more resisted; thousands of leftists killed by Pinochet’s regime in Chile; thousands of miners in Thatcher’s England; and those of my parents’ generation who unsuccessfully fought a sudden, disorientating wave of restructuring initiated by the Fourth NZ Labour Government. I was raised with the idea that “socialism was a nice idea that didn’t work” – that there is no alternative – and didn’t come to understand this history until well into adulthood. Reactionary complaints about the apathetic ‘selfie generation’ also conceal more than they reveal. My generation saw perhaps the largest ever global mobilisation, against the Iraq War, a mobilisation that did nothing to stop that military assault. This perception of political powerlessness, this sense that there is no alternative, seems more likely to discourage youth from political participation than the ability to take pictures with our phones. A Baby Boomer coined the phrase ‘don’t trust anybody over 30,’ and in a certain sense he was wrong. Older radicals offer a reminder that not everyone grows conservative with age. Any socialist alternative to Labour and National’s business-as-usual will require the intergenerational self-organisation of workplaces, universities and communities. Otherwise, a privileged minority of millenials will find themselves managing a violent social system much like the one they were born into – likely dooming the species to extinction. The kids aren’t alright, but generational warfare is a distraction. Capitalism remains the enemy.